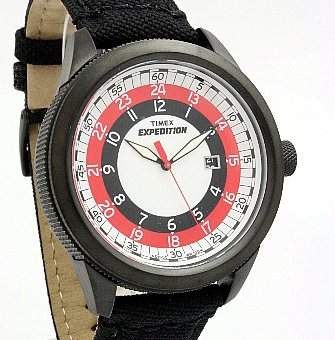 "Timex Expedition Military Classic, Ref. T49821H," ca. 2013. 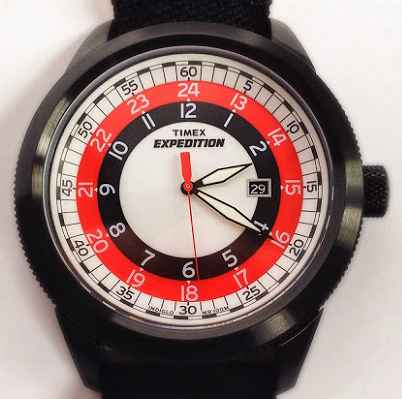 I'm not really a fan of this Timex, but I'm including it here to be complete, as part of a page I've written on a 1970's Timex version of the "Sprite" model. See this page for more details. 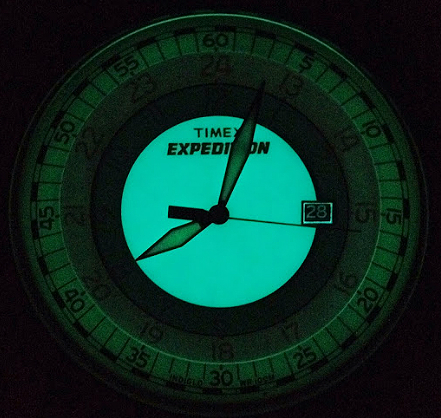 I've never seen this watch in person. I don't really like it, though, from pictures. 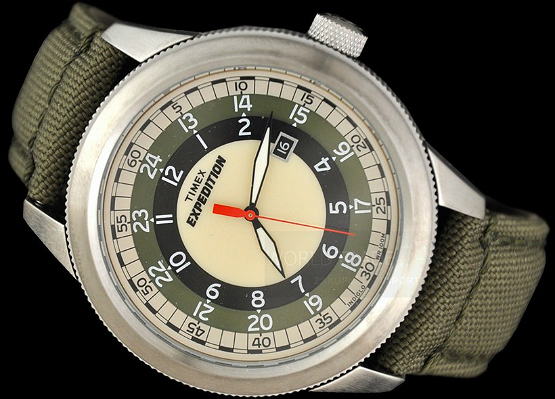 The dial clearly based on the 1970s Bullseye Sprite, and I think the dial design recreation is alright, though the central white proportion is off. 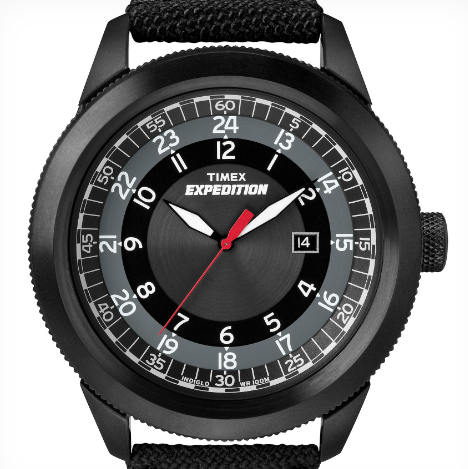 I guess also I don't like the black case with knurled edges, the EXPEDITION signage, and the translucent plastic dial with Indiglo light-up. 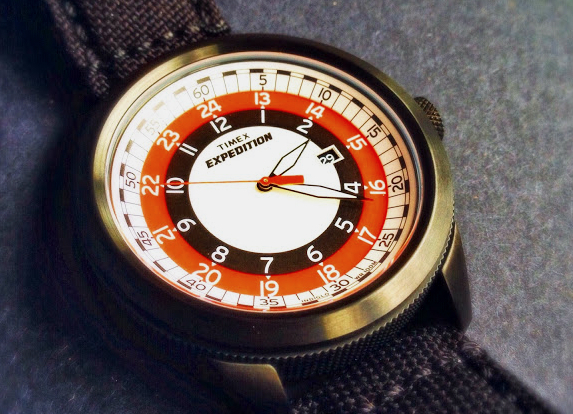 I've also never been much excited by the Expedition line of watches. 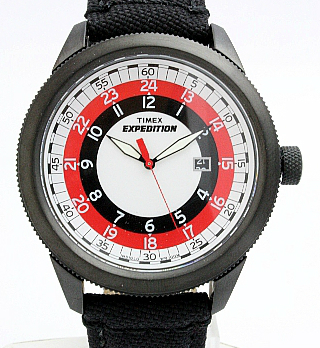 Given other watch options, I'd wear them over this one. I'm sure many would disagree, and I understand that. I do understand that I'm probably taking along some of my own prejudices and "baggage" with respect to watch aesthetics when assessing the appearance of this watch, but these are my feelings. 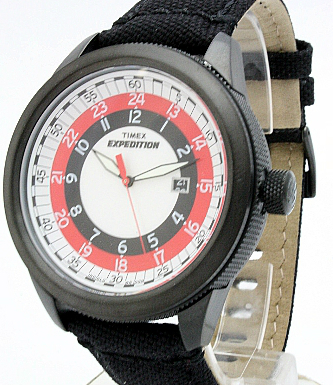 Also, below, are two different version of what looks like the same Expedition. The one with the green looks pretty good, as far as the color combinations, but suffers from the same things as the red/white/black one, to me.